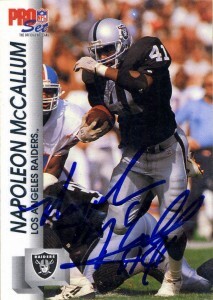 Napoleon McCallum was an amazing talent coming out of high school where he decided to sign and go to college at Navy. He’d redshirt after injury at first and then later go on to be a two time All-American as Navy’s star tailback and special teams returner, setting a then record with 7,172 yards from scrimmage and become the school’s all-time leading rusher. Drafted in the 4th round of the 1986 draft, McCallum would play one season with the Los Angeles Raiders rushing for 536 yards and catching 13 balls, before having to fulfill his 5 year military commitment. McCallum rejoined the team to a much different backfield in 1990, and was confined primarily to special teams. He also saw some goalline duty as a fullback with the team in 1993, rushing for 3 touchdowns. Napoleon in the postseason that year added 2 more TDs and appeared poised for a breakout season. Unfortunately before Napoleon could continue his career he was critically injured in perhaps one of the grizzliest plays in football history on Opening Day of Monday Night Football in 1994. Planting his foot and getting it stuck, he’d was tackled by Ken Norton Jr. As Napoleon went to the ground his leg literally came apart. The injury was so catastrophic that doctors almost had to amputate Napoleon’s leg. Needless to say- he would never play a down a football again. Since football, McCallum in total has had 6 surgeries to repair the damage to his leg but remains upbeat, plays a lot of golf and stays active. Napoleon was inducted into the College Football Hall of Fame in 2003.